This whimsical and fun design makes the perfect graduation gift. We chose a tone on tone background with graduation scrolls and chose a light grey color. 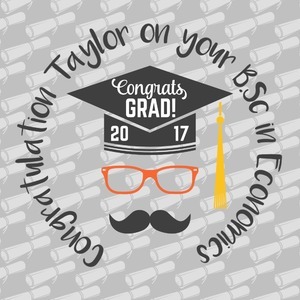 We chose graphic with circular text for our personalization style; change the text to suit your graduate. Customize the colors in the hipster graphic including the glasses, tassel and mustache color. We have other graduate backgrounds as well as graduate graphic in our system. So go ahead and change things to suit your graduate. Mustaches not your thing? No problem! we also offer more feminine or universal graduation designs as well. Make it unique by matching our graduation girls lips to her cherished shade.